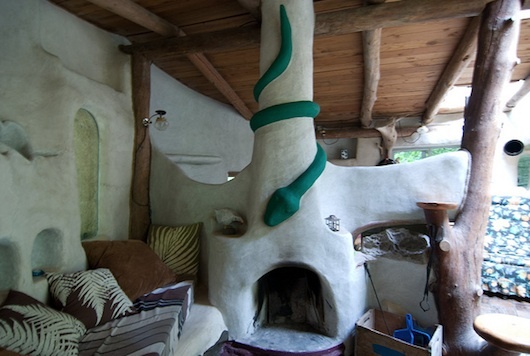 This cob fireplace was designed with a snake wrapped around it. Pretty unique! All of them are going to be different in each house because cob makes it easy to get creative. One day I'll get to attend a cob workshop and get some hands on experience! That must be fun, it's like creating a relationship with your house when your building it yourself... The walls, fireplace, and even sitting areas become unique pieces of art. Much of it done with your own hands. There are so many cool things about cob homes it's hard for me not to picture myself in one some day.